Christmas is on it's way and a lot of online casinos are launching their christmas calendar this weekend. One casino that is offering an amazing calendar this year is Thrills. As a player at Thrills you will be able to claim daily offers until christmas. And this is certainly something you don't want to miss so if you're not a member yet make sure you sign up immediately. You can read more about our exclusive welcome offer at Thrills below. This year's christmas calendar is open between 27th November and 3 January. In other words there are plenty of exciting offers to get during this period so preper yourself to be rewarded big time! 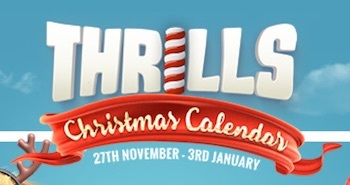 This Friday by 4 pm you will get your first offer in this year's christmas calendar at Thrills. The offer includes 5 free spins with no deposit required. These calendar spins are valid for all active members of the casino. The free spins are valid for you on the online slot Jack and the Beanstalk. As always all free rounds that are given away at Thrills are totally free from wagering requirements! So no wagering is needed if you win big time this Friday! On top of the no deposit spins there are additional free spins to claim. If you make a deposit of €75 or more and wager the amount in the casino one time you will get rewarded with 50 extra free rounds. These extra spins will be credited to your account the following day by 1 am and can be used on Jack and the Beanstalk. If you are a real loyal player at Thrills you can claim valuable Super Spins instead. UK players must wager their deposited amount at least 5 times during the day to be able to claim the 50 extra spins. Check out Thrills' new christmas calendar! For new players we have an exclusive welcome offer that includes free spins with no deposit required. To get these you must sign up through one of our bonus links. If you do this you will get 10 welcome spins on Starburst without having to make a deposit. Of course these spins are also free from wagering requirements. So all your winnings will count as real cash instead of bonus money which is good! On top of the welcome spins you can claim additional free spins and a generous welcome bonus when you make your first deposit ever to Thrills. And remember to check in daily now when the big christmas calendar is live!